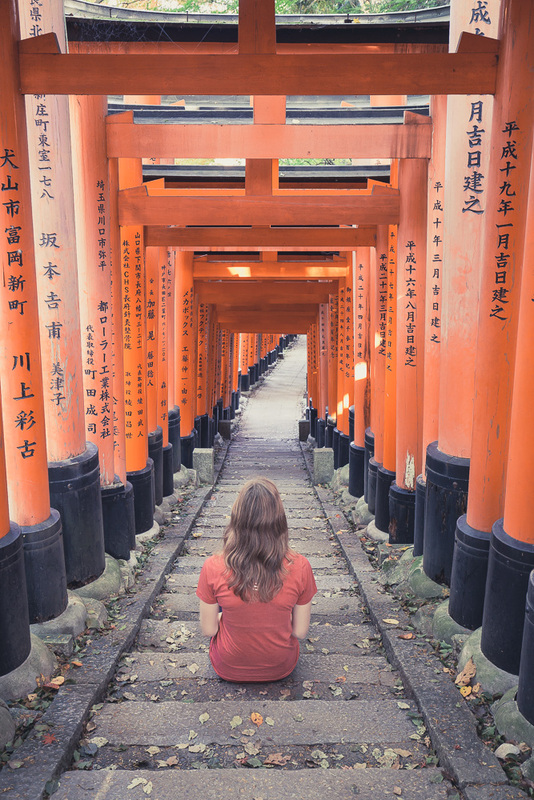 If you visit Japan, you'll want to see Kyoto; and if you're going to be in Kyoto, you absolutely must make sure that the Fushimi Inari Shrine is on your list of places to visit. For starters, it's completely free. Secondly, it's absolutely spectacular! Situated just a short walk from the respective Inari stations on either the JR line or Keihan Main Line, a trail leads you up the mountain through the forest. 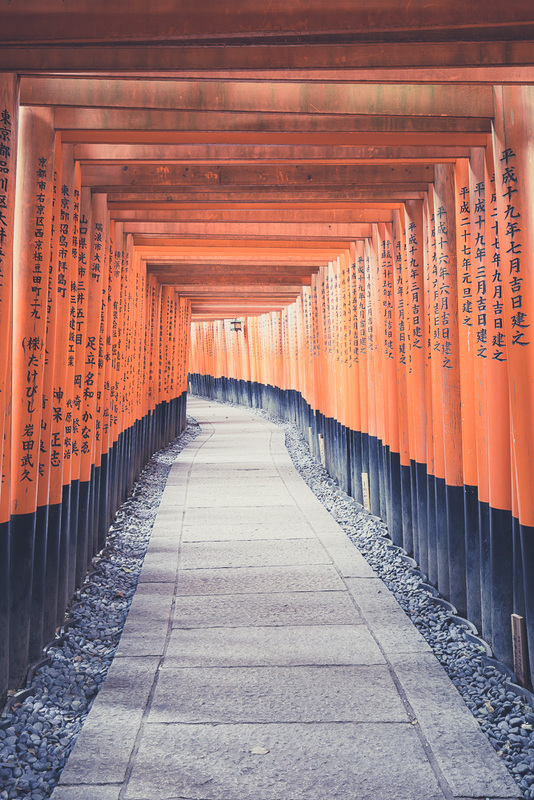 The pathway is covered by over 10,000 orange torii gates. Expect to take some time here, as the path ascends over 200m and is quite a long trail. 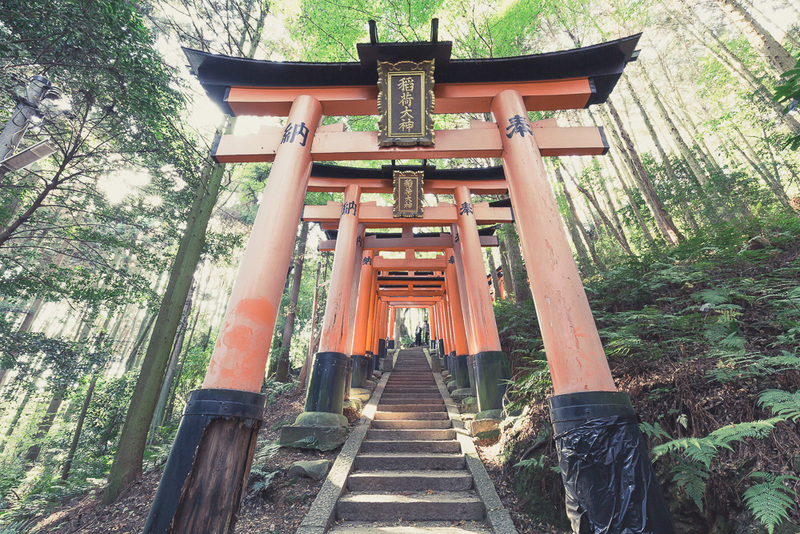 Along your journey, you'll find torii gates large and small. Depending on timing, you may find a lot of other people there too. I recommend arriving as early as possible (around sunrise) to enjoy the place in the calm morning light without people passing you by constantly. Due to getting a little lost, I didn't arrive as early as planned and other people were already around enjoying the views. Thankfully it was still early enough and one nice couple gave me great advice to head further along the path where there would be fewer people. In fact, every single gate here has been donated by an individual or company, and the name and date of the donation is written on the gate. As you continue along, you'll eventually have a break in the gates as you reach what feels like the summit: You made it! (spoiler alert: you're not really at the top yet, but almost!). 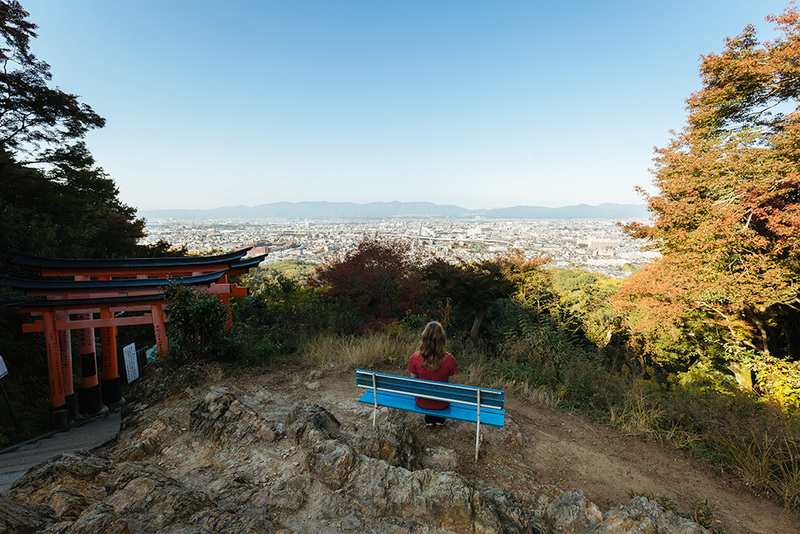 Here you'll be able to take a break and recharge as you enjoy the view over Kyoto down below. Once you continue onwards, the end is only about 10-15 minutes away. Here you'll be able to choose whether to continue along the loop which brings you back down a different path with even more torii gates (recommended) or you can circle back and head down the way you came. If you're going to do the recommended full loop, be sure to stop and look back throughout your journey as every twist and turn provides a unique and beautiful view of the pathways. Looking up at some of the largest torii gates near the top at Fushimin Inari Shrine. Each torii gate at this shrine is donated by an indvidiual or company, and the donor's name and date is inscribed on the gate. Another self portrait as I read the inscriptions on the torii gates. So beautiful! Arriving early gives you access to the shrine without floods of others, but you'll also be able to enjoy the magical moment where the sun rises high enough to shine through the tops of the gates. One of my favorite spots in the shrine. The sun had risen high enough to cast bright light outside of the torii gates, which provided shade. I absolutely loved visiting here and cannot wait to visit again, perhaps in the late evening when the sunlight has faded and the lanterns are lit up!